As you may have heard, our boy Ollie is going to be headed west this spring! He has been scheduled to move to San Francisco to start his new life and family. We know people have a lot of questions, so we did our best to answer them! Check out some of the most frequently asked questions below in regards to Ollie’s move! Won’t Ollie’s mom and the family miss him when he’s gone? Aren’t they more emotionally attached since they are in captivity? It really is a “natural” behavior for Ollie to be moving on especially since he is 9 years old. “Missing” someone is a human emotion – yes the other orangutans will notice when he leaves and they may even act differently for a day or two following, however, they will adjust quickly with minimal disruptions to their normal lifestyle. And don’t worry, baby Otis will be sticking around for quite a few more years to keep the family busy! What is the normal age that an Orangutan would leave the family? What is the age that they start maturing? 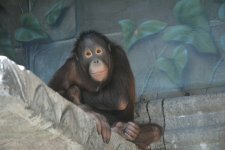 Male orangutan offspring would naturally leave the family in the wild usually around the age of 8; females tend to stay a little longer to learn how to be mothers by watching their own mothers. Wild orangutan females usually only give birth every 8 years (the longest time of almost any mammal!) so the female offspring stay to be able to observe a birth and rearing of an infant. Males will begin maturing around 10 years old and reach full maturity around age 15 (the time when they are able to sire their first offspring). What would happen if Ollie stayed here instead of moving on? If Ollie were to stay too long he could possibly start experiencing aggression from his father (a younger male trying to infringe on his territory). As he matures he will begin looking for a female and the only one we have here is his mother which could lead to inbreeding. Finally, staying with his dad could also “stunt” his maturing as male orangutans will not “bloom” or mature until they are on their own (i.e. get his cheek pads, air sacks, etc). Will Ollie be safe when traveling to San Francisco? We will do everything we can to ensure his trip goes as smooth as is possible. He will be transported by plane and will have a keeper accompanying him. What is waiting for Ollie at his new home? How does this benefit him and his species? The Species Survival Plan puts a lot of work into making these pairings and breeding recommendations to allow for the most genetic diversity of the species. Since the orangutan exhibit is a new exhibit for San Francisco, it will allow their visitors to be able to experience this magnificent species and educate them about the conservation status of these animals in the wild.